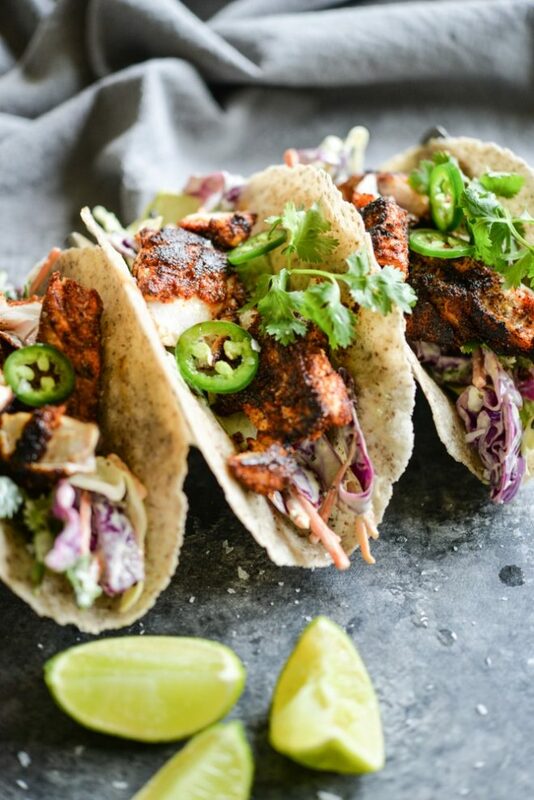 These Paleo-friendly Blackened Fish Tacos are an absolute WINNER! Serve them up with a fresh Mexican Coleslaw and in your favorite tortilla for a dinner sure to please everyone. 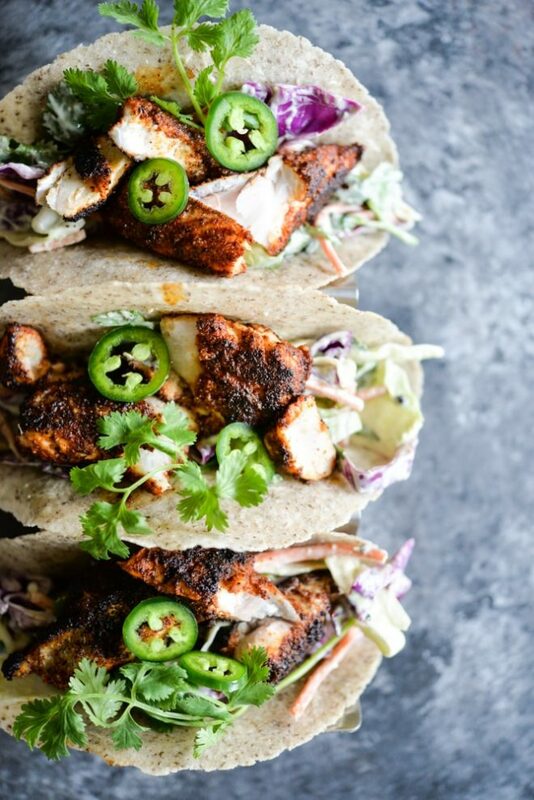 I am thrilled to finally bring you this recipe for Blackened Fish Tacos! Blackened is one of my favorite ways to order seafood when we're dining out. I just love the flavor and texture. That was until I learned that sometimes, less-than-optimal ingredients are added to many blackened seasoning mixes (think wheat, or msg, or soy, etc.). So, instead, I evolved my restaurant ordering to grilled fish instead. After years of forgoing blackened fish for what felt like TOO LONG, I set my sights on a homemade version. It took a little work, but what we ended up with is a HOME RUN, you guys. It's so good! I recommend heading to your fish market and asking the fish guy/gal for their best deal on wild caught (or sustainable) white fish. Red snapper (my favorite fish) happened to be on sale when I shopped for this dish, so that's what I grabbed. Cod, flounder, or grouper would all make good choices as well. The process from here is easy-peasy. Pre-slice your fish into either long strips (think fish sticks) or chunks. Place the fish in a large bowl and cover in the lime juice while you prepare the blackened season mix. The lime juice marinade helps to infuse even more flavor, but be careful not to let them sit too long. You'll end up with lime-cooked ceviche if left unattended for longer than 30 minutes. 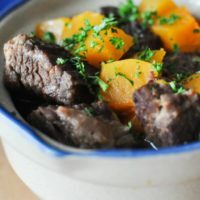 In a medium-sized bowl, whisk together the dry seasoning ingredients. Heat up some butter, olive oil, avocado oil, or your favorite cooking fat in a large skillet over medium-high heat. Drain the lime juice away from the fish and get to frying! Simply “batter” the fish in the seasoning mix and then fry them in the hot oil for 3(ish) minutes on each side, or until flaky white. Transfer the cooked fish to a separate bowl and set aside, continuing the process for the rest of the batch. 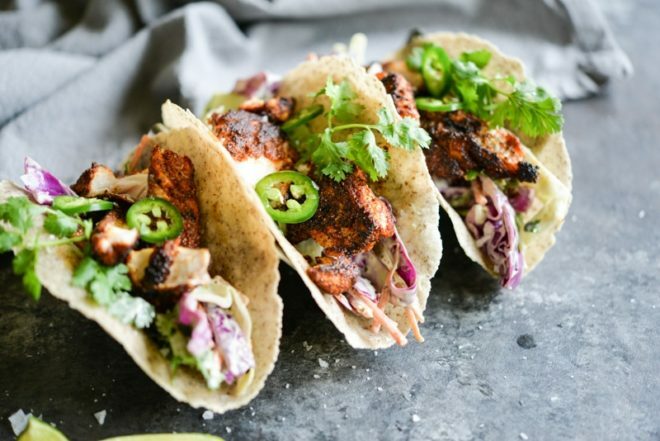 To plate, I recommend heating up a couple grain-free tortillas (or corn, if you tolerate them), layering with a scoop of Chunky Mexican Coleslaw, adding a few pieces of blackened fish, and then topping with fresh cilantro, jalapeno (if you like), maybe a sprinkle of fresh lime, and just a small pinch of sea salt. 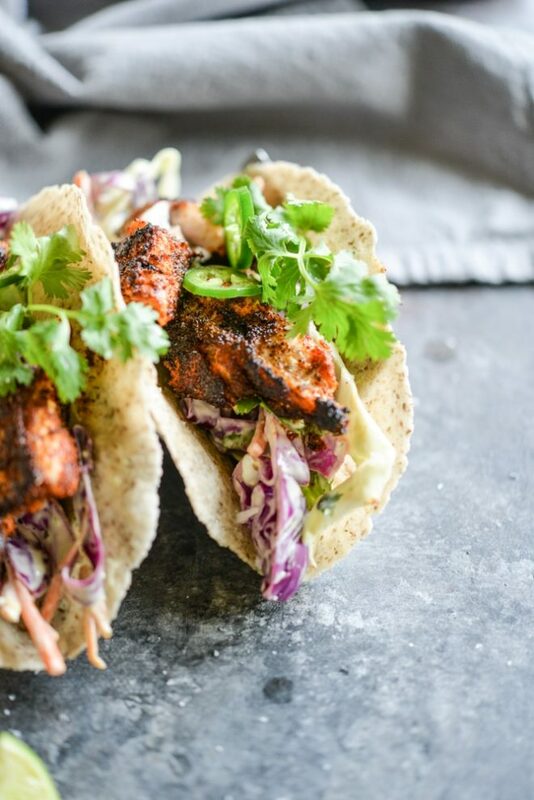 I hope you love these Blackened Fish Tacos as much as I do! 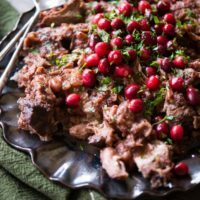 Note: you can also use a large slice of jicama as a tortilla as well! I have tip for perfectly pliable jicama tortillas in my Fed & Fit book (take a peek at the Barbacoa recipe). Place the strips of fish in a large bowl and cover with the lime juice. 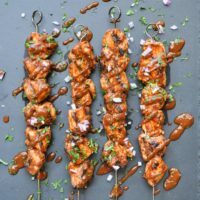 Let marinade for 5 to 10 minutes, but no longer than 20 minutes. Drain the lime juice off once finished and set the fish aside. In a medium-sized bowl, add the blackened rub ingredients together and whisk to combine. Add the cooking fat to a large skillet over medium-high heat. Once heated, start cooking the fish. To cook the fish, dip each piece into the blackened rub and coat well on all sides. Place the seasoned fish in the hot oil, cooking each side for about 3 minutes, or until flaky and white. Transfer the cooked fish to a separate bowl or plate and repeat for the rest of the batch. Serve in the tortilla of your choice with the Chunky Mexican Coleslaw, fish, cilantro, jalapeno, lime juice, and sprinkle of sea salt.